If you are looking for a 30 day diet meal plan, you are probably hoping to drop weight quickly. Weight loss is the simple matter of consuming fewer calories than you burn each day. As simple a concept as it is, many people find this to be very difficult. Here are a few examples of the kind of diet you should eat in order to lose weight. Depending on how much weight you want to lose, a diet can be more or less restrictive. If you want to lose many pounds, it may require more than a month. Additionally, many individuals find it helpful to accompany their diet with several days per week of rigorous cardiovascular exercise, as well as two to three days per week of weight training. Below are a few meal ideas that will help you create a calorie deficit resulting in weight loss in 30 days or less. Just because you want to lose weight doesn't mean you should skip meals. Eating breakfast is one of the best ways to jump start your metabolism for the rest of the day. Don't forget this important meal. Oatmeal - Nutrition experts have been touting the fantastic health benefits of this breakfast food for years. Whole oats are much preferred over the instant stuff, and forget the flavored packets. Flavor your own with nonfat milk, honey, and fresh berries for a hearty meal that will keep you satisfied for hours. Whole Grain Cereals - There are a multitude of different options that make a great start to your day. Cereals, like Cheerios, Shredded Wheat, and Wheat Chex work well paired with a piece of fresh fruit. Make sure to use nonfat or low fat milk and drink it when you're done. The calcium and protein in dairy products will help you stay full. Toast and Eggs - Yes, breakfast can really be traditional, even on a diet. Pair two slices of low calorie, whole grain bread with one tablespoon fruit spread without added sugars. Scramble up three egg whites with a little touch of salt and pepper for taste. Whether you're looking for a quick lunch on the go or a simple make at home meal, choose from healthy options like these. Salad - There's nothing better for an individual trying to watch his or her weight than a large green salad. Throw in any of your favorite green vegetables, like romaine lettuce, broccoli, cucumbers, and celery, along with tomatoes, radishes, or cabbage. Top with a couple tablespoons each of low fat feta or goat cheese and a fat free salad dressing of your choice. Fresh Fruit or Vegetable Smoothie - If you don't have the time to sit and eat a typical meal at lunchtime, try making yourself a smoothie ahead of time. Use a juicer to create a delicious vegetable cocktail of fresh carrots and ginger. Sweeten the juice with a small amount of 100 percent apple juice. Healthy Frozen Entrees - Talk about simplicity! Many brands, such as Smart Ones, Healthy Choice, and Lean Cuisine, make tasty and healthy microwaveable dinners that can be warmed quickly and provide the necessary nutrients to keep you full. For busy moms or dads on the go, dinner can be a very stressful time between family and work obligations. However, cooking at home can cut many calories. Consider making grilled chicken ahead of time and pre-chopping vegetables to cut your time in half. Grilled Chicken and Vegetables - Pair three ounces of grilled chicken breast with a fresh green salad or with three-quarter cup of your favorite green vegetables, like peas, for a delicious healthy evening meal. Pouched Salmon with Rice and Salad - Salmon is one of those hearty fish that really satisfy dinner time hunger. Serve your fish alongside one-half cup brown rice and a small green salad with fat-free dressing. Low Fat Spaghetti - Craving carbs? Have them! But, remember to buy whole grain spaghetti and to use ground turkey instead of the more fatty ground beef. 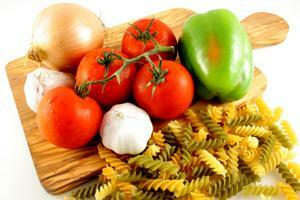 Make your own sauce using fresh or canned tomatoes, rather than pre-made sauces that can contain added sugars. If you need a more specific 30-day diet meal plan, you may want to consult a nutritionist who can tailor a plan to your own needs and food likes and dislikes.